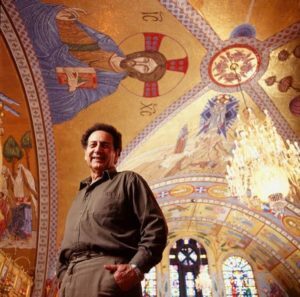 For nearly 50 years, artist Robert J. Andrews has devoted his life to creating mosaic icons in the Byzantine style for churches across the US and UK. We visited one of his beautiful masterworks, the Transfiguration of the Saviour Greek Orthodox Church in Lowell. 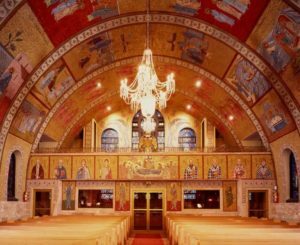 This church, which is affectionately called the “miniature San Marco’s of Venice”, is bedecked from floor to ceiling with mosaic icons from the hand of Andrews. Over 20 NEMS members and guests learned about the mosaic icons by tour guide, Father Tom. 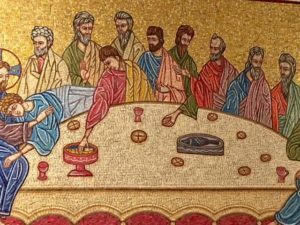 The mosaics were paid for and commissioned by church members. 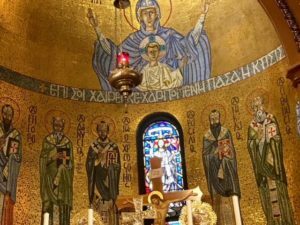 The mosaic work at Transfiguration began in 1963 with the Platytera, mounted in the apse behind the altar and continued for 50 years until 2004. 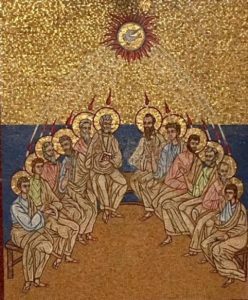 The composition of the icons is dictated by the church tradition, but the patrons of the Transfiguration Greek Church requested a predominance of female saints be included in the icons. Father Tom described the process of creating a mosaic icon. First, Andrews prepared a “cartoon”, a drawing on paper of the proposed design. These hand-painted drawings were then sent to Citta d’Arte, a school and studio in Tuscany, Italy, where artisans hand-cut glass tesserae based on Andrews’ color drawings. In order to adhere to his artistry, they selected from over 5,000 different colors of glass. The glass tesserae were carefully set in and glued to the reverse side of his line drawings. When completed, the icon was carefully divided into units for shipping. Hauled to the west coast of Italy by truck, they were sent by ship, and sometimes by air, to United States. Andrews opened the crates and lay them out on the floor of the church. He inspected the work for any changes or corrections in reverse, since the mosaic laid face down on the paper backing. Only after the process of spreading the mortar on the wall and using special tools to beat and butter the icon into position, did he finally peel off the paper and see the result of his vision. There was an engaged Q&A session and time to explore the mosaics. It was awesome!